Data Center is a facility used to house computer systems and the supporting infrastructure, which includes data storage systems, telecommunications, data connectivity, equipment housing and support, electrical power distribution, backup power systems, environmental systems, fire suppression systems and security systems. The world's largest operating data "campus" (2.2 Million Sq. Ft) with the world's largest Data Centers is situated in southern Nevada to avoid natural disasters. 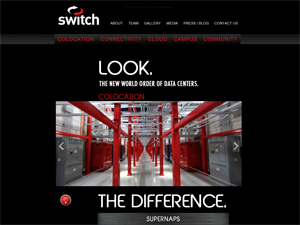 The Switch SuperNAPs are the highest-density, safest, most interconnected technology facilities in the world, currently powering servers for the globe’s leading companies. The SuperNAP is home to a fiber interconnection nexus that enables bandwidth, transport, and voice at incredibly low prices. 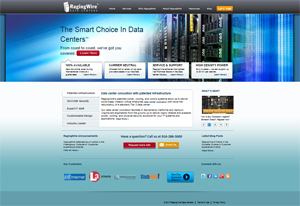 RagingWire’s patented power, cooling, and control systems allow to be delivered world-class, mission critical enterprise data center colocation with twice the redundancy of a standard Tier 3 data center.RagingWire’s data center campuses in Sacramento, California, and Ashburn, Virginia, provide connectivity from a wide variety of local, regional, and national telecommunications carriers. 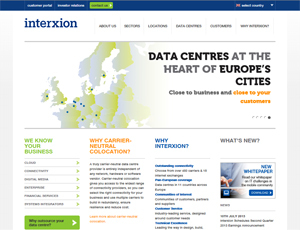 Interxion is a leading provider of cloud- and carrier-neutral colocation data centre services in Europe. Interxion support over 1,300 customers through 34 data centres across 11 countries, enabling these customers to securely deliver mission-critical applications and content to end consumers, with excellent response time performance.